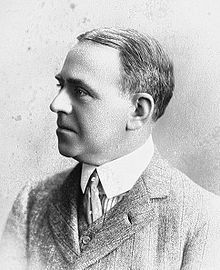 From Wikipedia – “Edward Phillips Oppenheim (22 October 1866 – 3 February 1946) was an English novelist, in his lifetime a major and successful writer of genre fiction including thrillers. Oppenheim, featured on the cover of Time magazine on September 12, 1927, was the self-styled “prince of storytellers.” He composed some one hundred and fifty novels, mainly of the suspense and international intrigue nature, but including romances, comedies, and parables of everyday life. He was the earliest writer of spy fiction as understood today, and invented the “Rogue Male” school of adventure thrillers that was later exploited by John Buchan and Geoffrey Household.